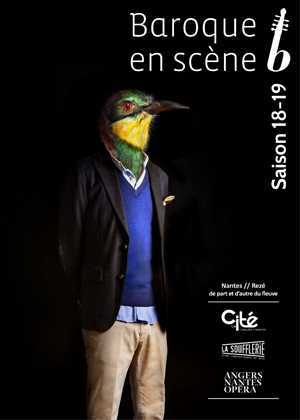 Launched in 2012 by La Cité and La Soufflerie, the Rezé subsidised theatre with a particular focus on voice, the “Baroque en Scène” season brings together the City of Nantes and the Town of Rezé. They both share the same desire to unveil to the widest audience all the various expressions in Baroque music, a key artistic and cultural movement in musical history. The programme is built around Baroque music, theatre and dance, and features performances in both Nantes and Rezé. It also aims to stimulate new experiences. This season gives the public the chance to discover or rediscover the masterpieces of a large number of composers who influenced the exceptionally rich Baroque period. It will be possible to listen to well-known highly-talented artists who will show just how vibrant and diverse Baroque music is, and how even today, it carries us away. To highlight the universality of this unique language and to promote Baroque music and its amazing artists, the “Baroque en Scène” season is intended for all audiences, with special attention given to school children and people with little cultural background. To that end, the festival has introduced reduced and very low rates. With a constant educational approach, each concert features an introduction in the form of a conference. A better understanding of the music work and its context help us see how much Baroque music has to offer. Each season comprises around 15 concerts held in two venues: the 800-seat Auditorium at La Cité and the Rezé Auditorium.